Find and compare the best prices from a range of well known car rental companies at Kos Island International Airport. This is a free to use facility, enabeling you to book direct with the company quoting the price. The airport was built in the 1960s, with the current terminal building dating from 1997. However, now that the Fraport group is involved in the airport management, improvements are expected. 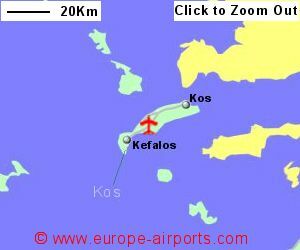 A bus service links the airport with Kos town, the 40 minute journey costing approximately 3.50 Euros. A taxi from the airport to Kos is likely to cost 60 Euros for the 35 minute journey. 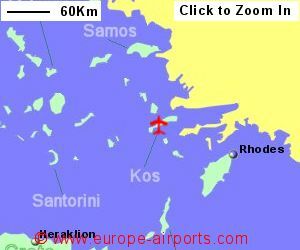 Kos airport has 5 bars/cafes/restaurants, shop, a bank/money changing facility, and FREE WiFi Internet access. 2.3 million passengers passed through Kos airport in 2017, an increase of 2% from the previous year.